A North Carolina restaurant is serving up a "Tarantula Burger," and unfortunately it's exactly what it sounds like. Bull City Burger and Brewery host an “Exotic Meat Month” every April to celebrate exotic meats eaten around the world, and this year the hairy spider is on the menu. 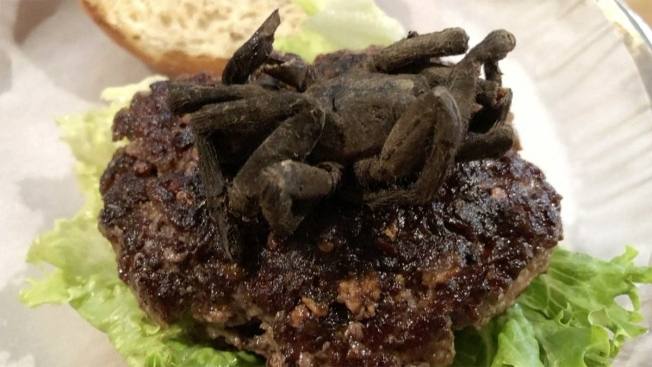 The dish looks just like a regular burger, however it has a huge, cooked tarantula perched on top of the beef patty. The burger is only available by lottery, whereby interested patrons need to enter in the restaurant and then watch its social media channels to see if they've won. The challenge began April 4 and will continue while supplies last, the restaurant says. Watch a reporter eat one above.